Ideologies are of paramount importance, not because they may give clue how much particular entity might pose jeopardy, but, because only ideologies may give experts clearer insight into the geo-political objectives of organizations or at least «gut feeling» about future trends in the field of interest. Amidst 20th century, It is the ideological break in Communist International, that formed new geo-political paradigm of the world. Post World War I, ideological split between German Social-Democratic and Communist Party has done far more to facilitate Hitler’s rise to power than Hitler’s own genius or generous donations of international lobbies to Nazi Party. Thus, there is an important lesson for everybody: Ideas are born in the process of geo-political changes and, thus, can make difference in geopolitical landscape. Therefore, it is significant to track any ideological change and their evolutionary path in Global Jihad. The ideological backbone of Al-Qaeda mainly constitutes pan-islamism and wahhabism. As two individual divisions of salafism, both ideas, as such Panislamism, heavily inspired by Egyptian Islamic Brotherhood, and Wahhabism, loosely based on the teachings of Saudi conservative clerics, have as many differences as their similarities. But, in the long run, their elements fused together to form the military-political doctrine of Al-Qaeda. On the contrary to what many people believe, it is not Bin Ladin’s choice or Azzam’s influence. Have it been Azzam’s influence, this ideology would soon be abandoned after his assassination. Seemingly, Bin Laden and (partially) Abdullah Azzam themselves were long-term human-products of this evolutionary ideological transition. Instead, it would be more rational to consider the possibility that these ideas have been absorbed into a new Islamist revival movement under the impact of geopolitical circumstances of the periods that have driven their revival, consolidation and dissemination. Thus, to identify how Al-Qaeda’s ideology formed in such a manner that can allow simultaneous unification of the two rival ideas (20th century Saudi Arabia was the hotbed of rivalry between Qutbism and Wahhabism), it would be useful to look back at its history of foundation. In 1979 an increasingly bipolarized world by the two superpowers has gone to a new phase of tensions due to Soviet invasion of Afghanistan. For some countries, such as the United States and European Union, it was a challenge. However, there were several states that saw this change not as a challenge, but, in fact, as a chance-opportunity. Oil-rich Gulf countries were accumulating vast amount of wealth out of the exports of oil products. In order to keep the constant flow of income, they were to keep political stability. Soviet occupation of Afghanistan was a unique opportunity for them to improve their relations with Western bloc and to divert ever-growing religious proto-fundamentalists’ attention to another topic. In this way they would get easily rid of disillusioned radical people in their countries by sending them to Afghanistan for the so-called «holy war». U.S government allied with some Gulf States adopted two strategies to defer Soviet theat. To sponsor rebellious conservative Afghan right wing against Soviet-backed leftists. To send disillusioned citizens of Gulf states to Afghanistan as foreign recruits, i.e in fact, as mercenaries. Former strategy later resulted in the emergence of Taliban, while the latter gave rise to a new global Islamist movement — Al-Qaeda. For the effective implementation of the latter strategy, Gulf states needed ideologies to persuade their disaffected part of population to join into » the right path». Any ideology cease to exist, let alone generating long-term effects, if it does not conform particular criteria: relevance, authenticity and popularity. Panislamism and wahhabism were the only candidates that could conform the requirements despite their rivalry and differences in their interpretation of Islamic creed. They were geopolitically relevant and easy to contextualize due to the former’s expansionist ambitions and the latter’s justification of armed war and fierce stance against Soviet’s notorious ideological propaganda: atheism. Both ideologies (de facto movements) were authentic, because they were historically well-tested in similar situations. Above all, both have already been regionally widespread and well-rooted since their initial progression. Accordingly, panislamism i.e Islamic expansionism would advocate the liberation of Islamic lands from foreign colonialists and the restoration of Islamic sharia law. The main masterminds behind these ideas were Hasan Banna and Sayyid Qutb, both of whom promoted these ideas against then-western-backed Egyptian monarchy. But, it is likely that other forces thought them to efficiently be exploited in the context of Soviet invasion of Afghanistan. Likewise, the emergence of the other idea, that is wahhabism, goes as far as to Arab revolts against Ottoman rule by Saudi family and local cleric — Mohammad Abd al-Wahhab. This idea, which essentially and aggressively promotes armed «holy war», was also contextualized to the armed resistance against Soviet rule of Afghanistan due to the geopolitical necessity of the respective time period. Indeed, both ideas have been as aggressive as they are today. They were present and were steadily growing even prior to and during the Cold War on account of Palestinian war and other conflicts in Muslim countries. But, the point is that they had not been globalized at that period. Soviet invasion of Afghanistan unprecedentedly accelerated their growth and exported their geopolitically effective elements into an entirely new global brand — Al-Qaeda. In this way, books written by Hasan al-Banna and Sayyid Qutb along with notable Saudi clerics, who can be epitomized by Hamud Oqla Ash-Shueybi, Abu Muhammad Maqdisi and others came to be taught in Al-Qaeda training camps as well as cells organized by or collaborated with al-Qaeda. Henceforth, An entirely new ideological phenomena based on established conceptual foundations, branded as Al-Qaeda, which had its own political objectives to achieve, have already come to existence (and was claiming to dominance and statehood). To continue its existence, the organization had to undergo gradual radicalization until its slight moderate approach recently. In 1989 Soviet army withdrew from Afghanistan. It was a one-sentence definition of this new strategy. As regards the other approach, Saudi Arabia and the governments of other countries alike were labeled as infidels who collaborate with non-believers based on the teachings of Muhammad Bin Abd al-Wahhab, who in his book — «Matters that Nullifies Islam» claimed that those who collaborate with non-believer become non-believer themselves.» (The same idea that ISIL later used against its former brother Al-Qaeda) Again, it is worth noting that, such ideas have been present in radical Islamism for decades and even centuries on smaller scale. But, after these historical events, Al-Qaeda imported them into its ideological tenets in a more radicalized form. In fact, Al-Qaeda ideologically did to Western countries what they had done to the Soviets before. After 9/11 incidents, as Al-Qaeda was come heavily on by US armed forces and international coalition against terrorism, its ideology more and more drew its attention to propaganda and the symbolization of physical armed movement i.e. transitioning the single military entity into a splintered factions and lone wolves loyal to global ideology under the shadow-organization due to Al-Qaeda’s inability to coordinate its forces directly and to reach out radical Muslims that have not joined their ranks yet. Internet was (an is) a tactical tool for the achievement of this goal. Ideologically, Absorbing the elements of Islamic movements that largely focus on Islamic propaganda was ideological tool to attain maximum effectiveness. Within the last decade, however, after long years of radicalization, it can be noticed that the ideology of the group went back slightly to moderacy. Due to Syrian Civil War, Al-Qaeda has taken the bulk of territory. As many and many hardliners preferred ISIL to Al-Qaeda in the wake of the dispute between the groups, Al-Qaeda began seemingly to change its interpretations of sharia. In Syria where al-Qaeda-backed Nusra Front gained one of the key-cities Aleppo, the group reportedly began to enforce sharia laws in more moderate methods, sometimes, completely abandoning them. It may possibly be due either to Al-Qaeda’s ideological maneuver on the brink of losing its grip over several local terrorist organizations to ISIL or to pacify the population of the occupied territories in order not to lose them. It is, thus, the geopolitical situations that determine what ideological approach Al-Qaeda will turn into in the near future. In a new form, Al-Qaeda’s ideas have been unified and transformed in a way that would be appropriate to coin them as neither wahhabism, which was liberalized under international pressure nor purely panislamism, which came to oppose armed struggle. 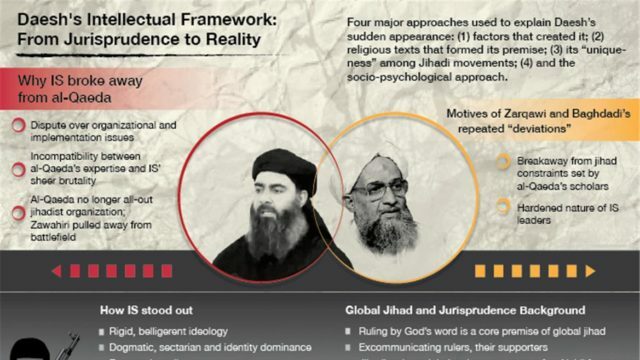 Some scholars use the term — radical salafi-jihadist movement to define Al-Qaeda’s main ideological characteristics.